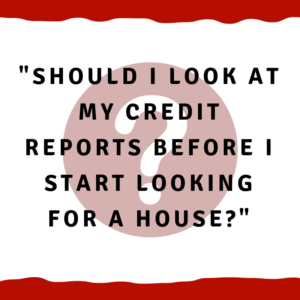 Should I look at my credit reports before I start looking for a house? Let’s dive in briefly on each one of these points. Whether we like it or not — whether we think it is fair or not — our credit reports directly impact our credit scores. And our credit scores impact what type of loan we qualify for when buying a house. Beyond our credit scores, there can be problems on our reports that prevent us from buying a home or getting a certain type of loan. Put all of this together and the bottom line is what our reports show — and what our credit scores are — have a huge impact on whether we will get approved for a mortgage loan. And the price we will pay for that loan in terms of an interest rate. The first step is to see what your reports say. You can pull your reports for free from AnnualCreditReport.com. This will get you your Equifax, Experian, and TransUnion reports. You can also pull your Innovis report and your Sagestream report — while these two are not as prominent as the so-called “Big 3” it is still important to make sure they are accurate. When you get your reports, study them carefully. Even the addresses, places of employment, the spelling of your name, etc. If you see negative information, especially pay attention to this to see if it is accurate or not. Whether this is fair or not is beside the point. The point is if there are errors, you need to know about them. And it is almost certain that at least one of your reports has at least one error. And unfortunately, often you will find that you have multiple errors on several (if not all) of your reports. Whether the error appears small or big, it needs to be fixed. Something as “minor seeming” as a wrong address can cause problems in the mortgage loan process. So you need to fix all errors. Unfortunately, you can’t simply snap your fingers and have all the errors fixed. It takes time to fix them so you have to find the errors before you need to apply for a loan. The best way to fix the errors is to send a certified mail letter explaining to the credit bureaus why the information is false. And normally you will want to also send a copy of the letter to the furnisher — the company such as Wells Fargo or Bank of America who supplied (“furnished”) the information. Do keep in mind that the general rule is if you do not send the dispute letter directly to the credit reporting agencies, then there is no legal obligation to fix the error. You need to send the dispute letter directly to Equifax, Experian, TransUnion, Innovis, Sagestream, etc. Normally about 30 days after the credit bureau receives your dispute, they will send you a response. This is called the “results of the investigation” and you should receive one from each credit agency you sent the dispute to. If the error is fixed, that’s great! But if it is not fixed, you need to consider suing under the Fair Credit Reporting Act (FCRA) and possibly other laws. When we sue the furnishers and/or the credit reporting agencies/bureaus, it does a couple of things. First, it lets them know that you are not going to sit back and accept false information on your reports. This is disappointing to the furnishers and agencies. Second, it encourages them to immediately fix the problem. Why? Because if they don’t, even after you sued them, then it lets us argue to a jury that the amount of money damages the jury should award must be very high. Why? Because not even suing these jokers has gotten their attention so a big money damage award maybe will get their attention. Third, if this error is preventing you from qualifying for a home loan, your money damages will be very high and the bad guys know this. So again, it encourages them to fix this and make things right with you quickly. Pull your reports. So pull yours. Have your spouse or co-borrower pull their reports also. Study them. Are they 100% correct? Great! Get with your mortgage person to see how to improve your accurate reports. For example, which credit card should you pay off first, etc. But if there are errors, then dispute them in writing (certified mail) ASAP. If the errors are fixed, wonderful. But if the errors are not fixed, then look at suing whoever is responsible. We can help Alabama consumers every step of the way. And we only charge a fee if we sue. We get paid out of any settlement or judgment. And the judge can order the ones we sue to pay our fees. Call us at 205-879-2447 (or fill out this form) and we’ll be happy to help you fix your credit reports so you can get the best mortgage loan possible for your home you are going to buy.